The Loft and ARIA are at it again! This time bringing you the Jabode Entry set! This Far East inspired set is bound to make a statement in your foyer, hall, or any other space you use it in! 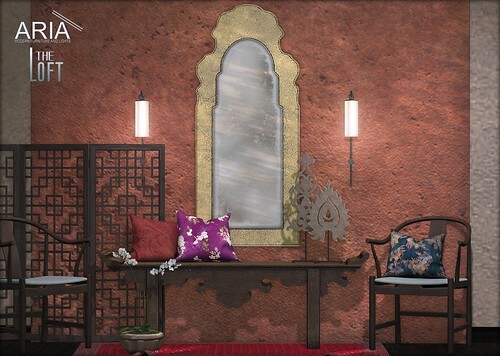 The set is complete with bench, chair in 2 variations, screen, mirror, rug, and mirror, as well as an orchid, wall sconces, decorative pillows and two beautifully detailed decor accent pieces. The Jabode bench comes in 6 different colours, each sold separately. Both the bench and chairs are packed full of singles and couples poses many with attachable props. The screen is available in 5 different colours, sold separate. The rug, throw cushions, and orchid come with texture change options and the sconces turn on and off on touch! The Jabode set totals 26 LI as displayed, and is copy and modify.